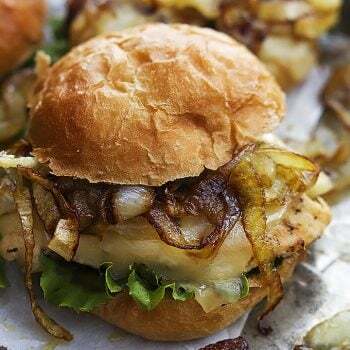 Juicy French Onion Chicken Sliders topped with melty swiss cheese and savory caramelized onions. These sliders….. you guys. SO AMAZING. The end. Gotcha! Not the end. I have more to say. Mostly about the juicy chicken. and the super melty swiss cheese. and the tender savory caramelized onions on fluffy slider buns. We had these for dinner a couple of weeks back (though really, they would make an incredible appetizer too) and I couldn’t get enough. If I’d had enough physical stomach space I would have eaten all 8 of them myself. My favorite part ended up being the dijon mustard, which usually I would go light on due to personal taste, but I ended up dipping these sliders into hoards and hoards of extra dijon mustard. I’m putting these back on the menu right away because I can’t get over how amazing the flavor of these soup-inspired sandwiches is! Plus they’re easy peasy and come together in 30 minutes or less! 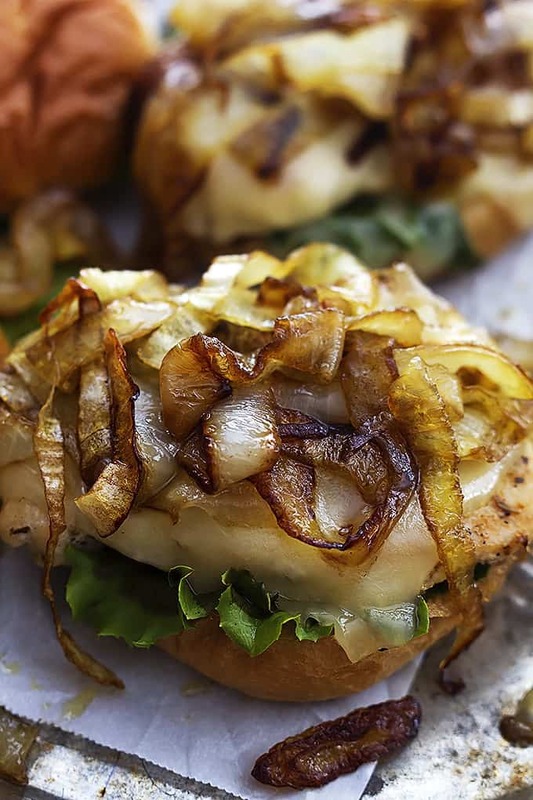 Winner winner French onion chicken slider dinner. 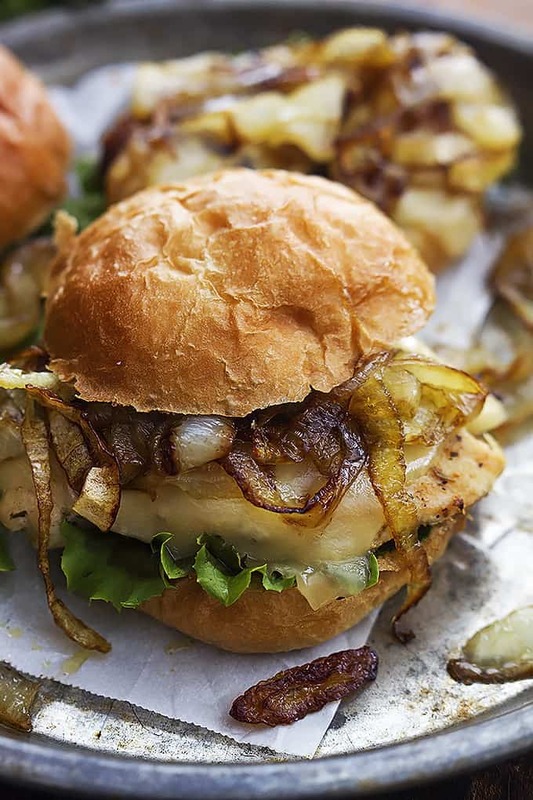 Juicy chicken mini sandwiches topped with melty swiss cheese and savory caramelized onions. Melt butter in a medium skillet or pan. Add onion slices and saute for 5-10 minutes until translucent and caramelized. Transfer to a bowl and set aside. Season chicken with salt and pepper to taste and Italian seasoning. In the same pan you used for the onions, cook chicken over medium heat 4-5 minutes on each side until cooked through. Place one slice of cheese on top of each piece of chicken. Turn off heat then cover until cheese is melted. Assemble sliders by spreading dijon mustard on one half of each slider bun. Top with lettuce, chicken and cheese, and caramelized onions then the second half of the slider buns. Serve immediately. 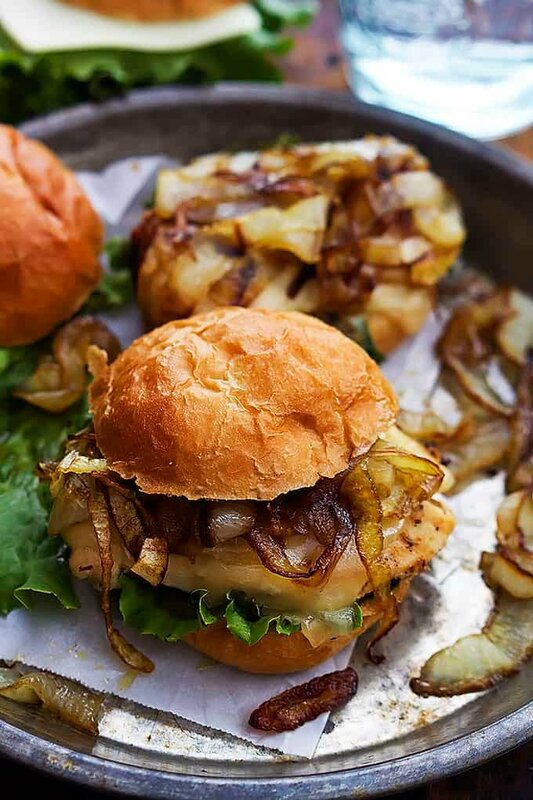 Try these other Slider Recipes you'll love! I’m there with you – french onion anything!! 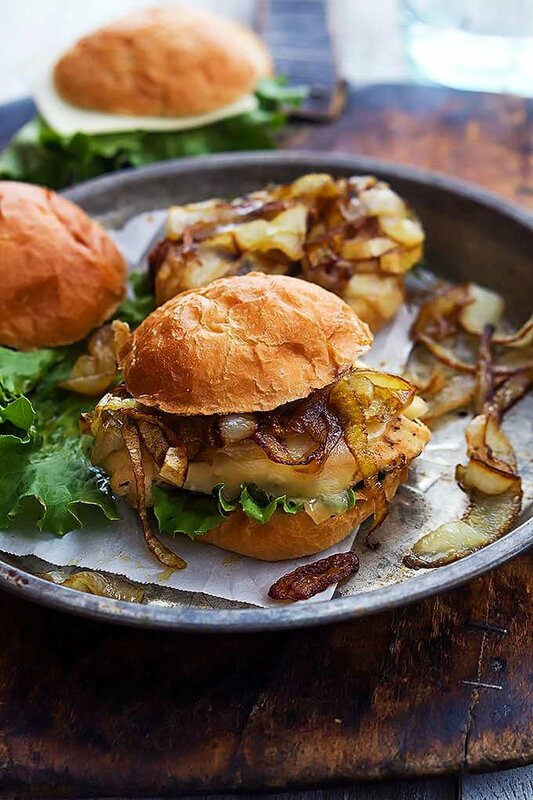 These sliders are to die for and the caramelized onions look amazing! Your photos are beautiful, Tiffany. These look really good. I love chicken sliders. I make extra for easy lunches. These should be a hit since I love French Onion Soup. Exactly! If you love french onion soup, you’ll love these beauties. And they would definitely be great for lunches Karen! Oh my gosh! These look amazing! Can’t wait to try them. Thanks Marsha! They really are SO yummy!! I made these last night, they were really good! My husband liked them too. Yay! Husband approval for the win!! This chicken slider looks amazing! Thanks so much for the recipe. We at Chicory really love your site and hope you can become our recipe partner. Are you interested? I’d love to learn more – Please submit an inquiry through my contact form! I don’t think sliders could get anymore delicious than when they are filled with such delicious caramelised onions like this. Definitely craving one of these sliders now. Totally LOVE these & pinned! !